One of the joys of being in a book club is not actually the books themselves. I know, this sounds perverse, but it’s true. If you’re a member of a book club then you’ll know exactly what I mean and if you’re not you’re be wondering what I’m blaring on about. You see, it’s the not the books that are the main event – it’s the conversations. It’s the insights shared that shine a light on the dark recesses of our psyche, the scantest overview or in-depth literary reviews that give the game away. We know at the beginning of a book club whether it’s going to be a good evening and consistently low scores all round are not always a good sign. What we’re looking for is a wild range of scores because that pretty much guarantees a cracking evening. So last Friday then didn’t have the hallmarks of a good evening with everyone scoring the book 3 or below apart from me – I gave the book a generous 6. 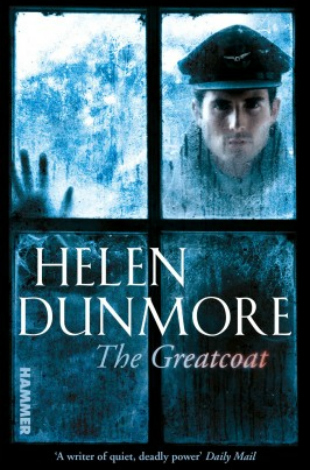 The book – The Greatcoat by Helen Dunmore – had been well reviewed in the press but of course that makes no odds. It was selected as the author is well-respected and it was her first foray into horror under the Hammer imprint. Before the meeting I’d had quite a positive feeling around the book having read it unusually for me in one stint on air-bound business trip. A couple of glasses of wine along the way also helped create a reasonably warm fuzz around the book. My colleagues had no such feelings. I opted to go last and waited patiently as, one by one, they clinically dissected the book. I couldn’t say I disagreed wildly with their assessments. Yes it was so short and probably should have been a short story and yes the characters weren’t exactly drawn in pin sharp accuracy, but I couldn’t find it in myself to dislike this book. It was a psychological wartime love story ghost chiller drama. Kind of. It didn’t know what it was and I quite liked that on top of this, it was short (which is always a bit of a bonus) and it had Lancaster bombers in it too. When I score a book highly and nobody else does, there’s always a nervousness around my critical faculties. Did I miss the obvious lemon of a character? Did I fall for the telegraphed denouement? But I don’t think I did this time. The discussion provoked thought and although we had a low scoring evening it was worth it and do you know what, it’s always worth it. So the book club is not about books it’s about everything else but the book, regardless of its quality I think. It’s quite a controversial thought…I’d love to know what you think if you’re in a book club? ← Beryl Burton – The Greatest Sportsperson ? I too am a member of a book club and we have some very lively discussions. There is the odd book that seems to unite everyone – The Book Thief – was universally loved yet others can have scores ranging from 2 – 8. I think it can also depend on the age of the reader. Books that we read as teenagers often leave us with differing views now we are older. I do enjoy my book club although I must admit I don’t alway enjoy the books!